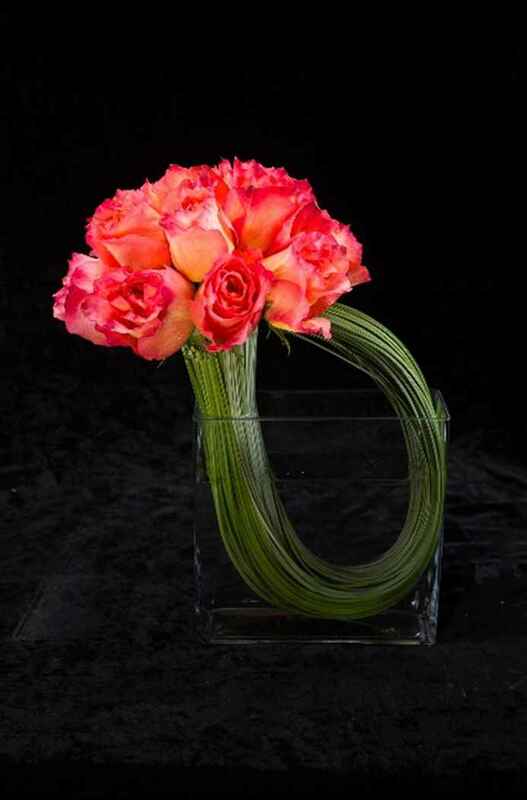 A sleek modern arrangement of 12 perfect roses with a clean grass loop. Every flower shop carries the classic rose. However, not all of them have this special variety. There are over 300 natural species of roses. They have been expanded by cultivators using selective breeding methods to create over 3,000 varieties. The colors and aromas of roses are amazing! The name of “rose” for this flower is a French word that derives from the Latin “rosa.” You can find roses growing all over the world in various forms as a bush, a tree, and a climbing vine. This is a very adaptable plant and its thorns give it protection from predators. Cultivators continue to experiment with new varieties. We use a more delicate version for this arrangement with a striking orange-red color. This color is highlighted with bright orange on the flower petal tips. Wrapping the stems of this charming bundle of roses with a deep-green colored grass loop creates a nice, eye-catching presentation in a crystal clear glass vase. This is the nicest flower shop near you in NYC when you want to buy roses people love and wedding flowers brides will appreciate. People use Roses, orchids, fire lilies and more to create terrific floral designs that are one-of-a-kind pieces of organic art. These designs follow the Asian principles of Feng Shui. In addition, they also have a Zen balance of yin and yang in their aesthetic statement. To buy flowers of beautiful varieties for weddings or other celebrations, Mahir Floral & Event Design flower shop offers the best flower delivery service in NYC. Allow us to help you make your next event memorable and order our flowers today!